Reflex™ LED minibars provide a compact yet powerful warning solution that features 12-24 VDC operation, uses high intensity LEDs and reflective technology to maximize light output and allows the user to select from a choice of 18 user selectable flash patterns. The 7160 Series – Reflex™ LED beacon provides the ultimate level of power, versatility and style available in an LED beacon. 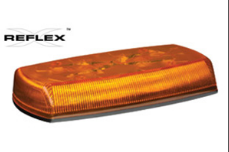 The latest high intensity LEDs combined with reflector technology produce a powerful, SAE Class I/Cal Title 13, warning signal in a light that also offers premium features including 15 flash patterns, hi/lo intensity control and synchronization capability. Low amp draw, zero maintenance and an extended life backed by a 5 year warranty make this light an obvious choice to replace strobe or rotating lights. The Hide-A-LED™ Bullet is a concealed LED warning light that features two high-intensity 3-watt LEDs to deliver an exceptionally bright warning signal. With a 2” shaft length, the ED0010 Bullet is designed to allow quick and easy installation in any headlight or taillight casing. Requiring only a single 1/2” hole, the Bullet’s shape overcomes the problem of difficult installation in the highly compact, double wall design of modern vehicle light casings. In addition, the Bullet is self-adhesive and requires no mounting hardware (can also be secured with screws). The Bullet features 10-30 VDC operation, 16 flash patterns, the ability to synchronize with additional units, and a 9’ cable.